Greetings from the JC Raulston Arboretum. On behalf of the staff of the JCRA, I am pleased to present this fall 2008 JCRA newsletter. This past spring and summer have been extremely busy for all of us here at the JCRA—lots of changes and progress have occurred in the gardens. We are fortunate that rainfall, although not abundant, has at least been adequate this year to sustain our collections without the need for regular irrigation. Measures are being undertaken to develop the irrigation infrastructure to allow the JCRA to utilize the water in the pond at the rear of the Horticulture Field Lab for our routine irrigation needs. Completion of this system will allow the JCRA to divorce itself from the municipal water system for irrigation purposes, which will be good for both the JCRA and the City of Raleigh. Some staff changes have taken place since the last newsletter. Layne Snelling, the coordinator of the JCRA plant breeding efforts, retired after almost 30 years of dedicated service to the Department of Horticultural Science and, most recently, the JCRA. Layne was the ultimate team player, and in addition to coordinating the plant breeding efforts, Layne assisted in many other ways to help the JCRA. Anthony Beck, our horticultural assistant, who had been such an integral part of the great changes that have occurred in the Arboretum over the last year, left us in late July to pursue a law degree. We will greatly miss Layne and Anthony, and wish them both the best. Autumn Keck, our former associate director of membership and fund-raising events, left the JCRA this past May after giving birth to a baby girl. We wish Autumn the best in this exciting new chapter in her life. I am pleased and delighted to share the news that Anne Porter, who has served in the past as the director of development for the JCRA, but most recently was director of development for CALS Academic Programs, has now returned to the JCRA as the director of development. We are pleased to have Anne back with us at the JCRA. Anne has so much passion for the JCRA and its members, and we look forward to her leadership in JCRA membership and fund-raising initiatives. One of our major garden efforts this year has been the renovation and expansion of the Southwestern Garden and adjacent beds. Although there were some great plant specimens in this area, the Southwestern Garden was showing its age and in need of serious attention and improvement. Guided by the new JCRA Master Plan and with the design assistance of the Master Plan committee, and through funding provided by the North Carolina Nursery and Landscape Association, the Southwestern Garden has been completely transformed into a dynamic garden space. The scope of the garden now transcends plants endemic only to the southwestern United States; hence the garden has been renamed the Xeric Garden to reflect the emphasis and inclusion of both North American and introduced drought-tolerant plants. The garden has only recently been planted, but it already demonstrates a character that only will be enhanced as the garden matures. In addition to the new plantings in the Xeric Garden, the JCRA has acquired 1,110 new plant accessions in calendar years 2007 and 2008, most of which have already been planted in the Arboretum proper. Although not all are necessarily new plants to the trade, most are first-time residents here at the JCRA. We invite you to come examine these new accessions. By the time you receive this newsletter, Mark Weathington, our assistant director and curator of collections, will have returned from his plant exploration trip to Taiwan, hopefully with some interesting plants for the Arboretum collection. Finding one's way through the Arboretum, and accessibility for handicapped and disabled guests, has always been problematic at the JCRA. This limitation was addressed in the JCRA Master Plan, and I am pleased to share that installation of a main path through the center of the Arboretum has been completed. Almost 300' in length, the new path extends from the existing Geophyte Border to the Necessary, and parallels the herbaceous Perennial Border. The path was constructed of Chapel Hill gravel, and includes a beautiful concrete edge with leaf pressings on both sides of the path. With this path now completed, navigating the central part of the Arboretum will be easier for all guests, and our handicapped guests now have an accessible route extending from the Bobby G. Wilder Visitor Center to the A. E. Finley Foundation Rooftop Terrace and from the Rooftop Terrace to the Necessary. Additional projects are planned to enhance our path system in the future. As you walk around the Arboretum on our new paths, please note the new permanent interpretative signs that have been placed adjacent to some of our special plants and gardens. These new educational signs have been created by Nancy Doubrava, our interpretive specialist, and will enhance our ability to educate and inform guests about our plants and gardens as they walk the Arboretum. Look for more of these to be added in the collections as the year progresses. These new signs have been made possible through a grant from the Stanley Smith Horticultural Trust. In the past three months, the JCRA has been host to some noteworthy groups. The Society for Economic Botany held their annual conference at Duke University in early June, and the JCRA was proud to be a co-sponsor. Over 150 U.S. and international scientists attended the conference, and as part of their activities, the attendees visited the JCRA for an evening dinner and tour of the collections. Later in June, the Garden Centers of America held their annual "Summer Tour" in North Carolina. The JCRA was pleased to host this group of over 100 garden center operators from across the United States for their evening program, dinner, and Arboretum tours on Monday, June 23. Attendees in both groups commented on the wonderful diversity and the professional appearance and presentation of the Arboretum collections, a testament to the efforts of all of our staff and volunteers. Later in this newsletter, you will find exciting news from Anne Porter regarding some recent major gifts to the JCRA. We sincerely appreciate the generosity of these donors, and their incredible support of the JCRA. Our spring 2008 Gala in the Garden was a great success this year. This was my third Gala since I became director, and it was great to have a Gala that was rain- and wind-free. This year's Gala raised over $80,000 for the JCRA, an all-time record. Thanks to all who made this event such a great success. It was great to have former JCRA director Bob Lyons join us for the Gala. Bob was at the helm of the JCRA at a very critical and difficult time, and so much of what we enjoy here today can be traced to his leadership. I am pleased to share that the JC Raulston Arboretum Endowment for Excellence general endowment fund has now reached almost $170,000. Growth in this fund is so critical to the future of the JCRA. If you are considering a gift to the JCRA, please consider making a contribution to the JCRA Endowment for Excellence. By doing so you can take satisfaction that your contribution will generate recurring yearly income to sustain the future operations of the JCRA. Many of you attended one of numerous Summer Solstice Celebration parties held in June to benefit the JCRA. JCRA supporters around the state hosted these fund-raising parties, and I am pleased to share that almost $38,000 was raised at these Summer Solstice Celebration parties. This is remarkable, considering this was the first year for this event. Funds raised at the Summer Solstice Celebration parties were equally divided between the JCRA Endowment for Excellence and the JCRA Master Plan. I extend a sincere thank you to all of the special hosts, the donors, and especially to Helen Yoest, JCRA board member and Arboretum supporter, who proposed and coordinated this event. We were fortunate to have a great group of seven student interns join us this past summer at the JCRA. This group of interns participated in diverse jobs and responsibilities in the gardens, and made significant contributions to all of our summer projects. Most noteworthy was their involvement in the renovation of the Southwestern Garden and the establishment of the new Xeric Garden. I am confident that their experiences at the JCRA have had a significant impact on their personal and professional development. I appreciate all they did for us. If you are interested in sponsoring a student intern in summer of 2009, please contact Anne Porter or myself. Sponsoring a JCRA summer student intern is a great way to benefit both the Arboretum and a deserving student. We are very excited about some of the new plants being developed in the JCRA plant breeding program. Our first Buddleja release, the compact 'Blue Chip', is doing quite well in its first year of introduction, and is available now in some garden centers. Later in 2008, a unique bright pink form we have developed will be released as 'Miss Ruby', in honor of Ruby McSwain, whose kindness and generosity made possible the Ruby C. McSwain Education Center at the JCRA. Ask for these cultivars when you visit your local nursery and garden center. Sales of each plant benefit the JCRA Endowment for Excellence fund. At the North Carolina Nursery and Landscape Association (NCNLA) summer trade show, we shared two new JCRA plant breeding releases with North Carolina nurserymen. Buddleja 'Summer Frost' is a beautiful silver-leaved form with semi-pendant branched panicles, similar to those of 'Dartmoor'. Lantana 'Sunset Beach', developed as a result of an undergraduate student research project some years ago, is a beautiful pink and yellow bicolor, fully perennial to at least Zone 8. We have lots of exciting new Buddleja in advanced testing; other great releases are planned in the near future. In our redbud breeding work, we are moving forward with three exciting new selections, and at this time are building up stock at a few redbud propagation nurseries across the country. We anticipate availability of these new JCRA cultivars in 2010 and 2011. Please take advantage of the upcoming Friends of the Arboretum Lectures for 2008 and 2009. Chris Glenn has done his usual excellent job of developing a diverse and excellent program. Remember, if you miss a lecture, view it online through our members-only link. Mark Weathington will continue his historically popular Plantsmen's Tours on the first or second Tuesday afternoon of the month beginning this fall. These, too, are recorded, and made available for member viewing. In this issue, you will find a diverse offering of interesting and educational articles. We are particularly pleased that Vikramjit Bajwa, a graduate student in the Department of Horticultural Science, has shared his expertise with us in this newsletter. Vikramjit's research involves the study of a class of plant hormones called brassinosteroids, and I was delighted when he agreed to write an article about brassinosteroids and other hormones involved in the control of dwarfism in plants. Thank you, Vikramjit! Before I close, I would like to express my sincere thanks to the JCRA staff for their efforts and dedicated service to the JCRA. We are a small staff faced with a big job. This group always rises to the challenge, and they are a wonderful group of people to work with. I've said enough. I'm sure your eyelids are getting heavy! Go get a cup of coffee. As always, thank you for your support, and please visit your JC Raulston Arboretum. Many of you may never get the opportunity to visit the Linnean Society in London, England, but the miracle of the Web allows you to view the incredible specimens housed in this facility. Plant specimens number 14,300, including 4,000 type specimens. For you butterfly enthusiasts, the Linnean Society has just recently made available digitized images of the Linnean butterflies and moths, part of the 9,000 insect specimens in the Linnean collection. This is just a great Web site to browse. One of the stated goals of the Linnean Society in making the collection available online is to "provide public pleasure and enjoyment" (like the JCRA! ), and they certainly have succeeded in doing such. The link is http://www.linnean.org. A recent article in the journal Science entitled "Where Have All Thoreau's Flowers Gone" by Elizabeth Pennisi summarizes an interesting study by Boston University and Harvard researchers who examined the current status of plants that Thoreau documented and recorded during his stay at Walden Pond. These researchers examined the current abundance and time of flowering of species that Henry David Thoreau had carefully documented for six years. Additionally, records exist on plant communities and flowering time from studies done around 1900 at the site. The researchers found that about half of the species documented by Thoreau had decreased significantly in number, and fully 20% had disappeared completely. The authors attribute some of this loss to global warming, as the region is thought to have undergone a 2oC increase in temperature since the mid-1800s. The research was reported at the Evolution 2008 meeting held in Minneapolis, Minnesota earlier this year. The giant coastal redwood trees inspire awe among those who stand in their presence. Richard Preston accompanies and describes the exploits of a small group of botanists and naturalists whose passion for the redwoods leads them to search for and study the ecology of these remarkable organisms. Refuting the common belief that there are no more "frontiers" in the United States, these researchers explored the previously uncharted and unexplored interior valleys of California that harbor these wonderful trees. Besides describing the discovery of new redwood trees and one tree now recognized as the largest redwood specimen in existence, much of the book is dedicated to describing the previously unstudied ecosystem that exists hundreds of feet up in the canopy of the redwood. An incredible ecosystem consisting of thickets of huckleberries, ferns, and myriad other plant and animal species exist in these canopies, and Richard himself learned tall-tree climbing techniques so he could experience and better describe the majesty of these trees and the ecosystem they support. Highly recommended. I felt better about myself after reading this book, for there is hope that yes, I can teach this old brain of mine some new tricks! Norman Doidge is a medical doctor on the faculty at Columbia University where he specializes in psychiatry and psychoanalysis. He eloquently describes recent research in brain function, and provides compelling evidence and case stories that debunk the historical dogma that the brain is hardwired early in life and incapable of significant neurobiological change as one ages. Rather, he shows that the brain is extraordinarily adaptable and capable of forming new neural connections in response to disease, trauma, and injury, focused training, etc. Chapter 8, entitled "Imagination" was particularly interesting, for it deals with the issue of developing new motor skills, such as learning to play a musical instrument. He describes the remarkable studies of "imagining" experiments, that conclusively show that one can build competence in new motor skill development (in this case, playing a piano piece) not only by physical practice, but also by imagining playing and hearing the piece. The entire book resonated with me. I believe you would enjoy this book, and find it useful in some way in your life. Hydrangeas are among the best known garden plants around. Despite being grown in the west for well over two centuries, there is still a legacy of confusion surrounding these worthy landscape shrubs and vines. About 25 species in total are generally recognized, with most coming from Asia and Central and South America. The main shrubby species available to gardeners are Hydrangea macrophylla, H. paniculata, and H. serrata from Asia and H. arborescens and H. quercifolia from the United States. These plants are grown for their large heads of showy sterile flowers. Hydrangeas owe much of their popularity to their flamboyant colors, impressive floral display, and ease of care. Once established, they are long-lived garden stalwarts. Establishment is important; new plants should be situated in a somewhat shady location with a rich, well-drained, organic soil and watered regularly for the first two years. H. paniculata is fine in full sun and slightly poorer soils; H. quercifolia will tolerate some sun, but will tend to droop in the hot afternoon. In general, hydrangeas are fairly drought tolerant once well-established, but look so poor under dry conditions that they probably shouldn't be grown where supplemental irrigation or a moist spot isn't assured. The exception is H. paniculata which is an exceptionally tough plant as is, to a lesser extent, H. quercifolia. Pruning hydrangeas has been a mystery for many people for many years. In general, hydrangeas do not need to be pruned, as evidenced by large, untended specimens around old homesteads. If pruning is a must, there are a few simple rules to follow. For H. macrophylla and H. serrata, flowers are formed on the previous year's growth, so pruning hard during the winter will greatly reduce or entirely eliminate flowering. Flower buds are generally formed along the stems, but only the apical or tip buds actually develop flowers. If these buds are removed, the lower or axillary buds will often develop flowers. Many hydrangeas can therefore be pruned back halfway or more in fall or late winter and still put on an impressive floral display. Before pruning, examine the stem for large (~0.5") buds, as not all cultivars produce these axillary buds. Another pruning method is to remove about a quarter or a third of the oldest stems at ground level each year on established plants. This is a good way to keep the plant healthy and vigorous and works well for both of these types of hydrangeas. Some of the newer remontant, or re-blooming, hydrangeas can be pruned hard over the winter and still produce flowers reliably. Pruning the other forms of hydrangea is a much simpler matter. H. paniculata flowers on new wood. It can be pruned hard in winter and will develop new shoots and flower heads that are often so large that the stems will bend under their weight. If pruned lightly or not at all, smaller, more numerous flower clusters are produced. H. arborescens flowers on new wood and should simply be cut to the ground in winter. The other southeastern native, H. quercifolia can be left alone or pruned lightly in late fall or winter for shape and to control size. All of these hydrangeas can be deadheaded after flowering or spent flowers can be left for winter interest, based on personal aesthetics. Flower color in the H. macrophylla/H. serrata selections is always another dilemma for gardeners. In the simplest of terms, the availability of aluminum in the soil determines flower color. In basic (high pH) soils, aluminum is tightly bound to calcium and is unavailable to the hydrangea, so the flowers will be pink. In typical southeastern soils, there is plenty of aluminum available and a relatively low pH, so flowers will tend toward blue. Many soils fall somewhere in the middle and flower color can be an attractive mauve. In the Lath House at JCRA, the soil is acidic due to the large amount of pine bark which would lead one to expect blue flowers. However, the lack of mineral soil means there is very little aluminum present and most of the flowers are purplish to pink. Additions of aluminum sulfate will help blue your hydrangeas, while a couple of cups of lime over the root system will pink them up. Some hydrangeas will stay bluer even where aluminum is not readily available and others will be pink even when it is. Discovered by Michael Dirr, Ph.D. , in the North Carolina Balsam Mountains, it has large sterile flower heads held on sturdy stems. Although similar to the more common 'Annabelle', the smaller flower clusters on stouter stems make it a tidier garden plant. Between the Butterfly Garden and the Finley-Nottingham Rose Garden. Burgundy flower buds open to reveal pink fertile flowers (no large bracts). A different look than the typical hydrangea, but a good garden performer. Discovered by Don Jacobs at Eco Gardens in Georgia. Toward the east end of the Mixed Border. Another odd native hydrangea, 'Emerald Lace' has lacecap flowers with dissected and irregularly cut foliage. Sometimes sold erroneously as 'Green Dragon'. Two specimens, one behind the weeping winged elm across from the east end of the Mixed Border, the other in the center of the Mixed Border. A large mophead hydrangea with huge inflorescences. Changes color readily with pH from light pink to bright blue. Next to the Ruby C. McSwain Education Center. One of our best performers, this lacecap is sited in sun here at the JCRA. This form tends to stay blue even under low pH conditions but will eventually turn rosy in the absence of available aluminum. In the Conifer Collection. A dwarf mophead with medium-sized flower clusters that fits in well beneath larger shrubs and small trees. Flower color often is midway between deep red and blue. In the Lath House. Stout, dark stems support richly colored mophead flowers, typically rose to purple colored. A vigorous grower with attractive foliage. In the Lath House. A dwarf form more suitable for smaller suburban gardens than other cultivars of this species. Next to the McSwain Center. Long, somewhat narrow inflorescences start lime green before fully turning white, then aging to a pale green. A vigorous growing shrub. In the District X Garden Club of North Carolina Wall Garden. A presumed H. macrophylla × serrata hybrid with typically pink flowers aging to a beautiful red in fall. Autumn foliage color is often a very nice burgundy. In the Paradise Garden. A heavy flowering selection with somewhat smaller leaves and shorter stature than the species. Medium sized, dense flower spikes are held upright. Fall color is deep burgundy. In the Lath House. A yellow-leaf form of the popular dwarf 'Pee Wee'. The color holds well in moderate sunlight and flowers are produced at a young age. Fall color is rosy-purple. At the corner of the Bobby G. Wilder Visitor Center. An old, but very reliable lacecap with larger sterile florets than the species. Pink to blue flower color, aging to rose. Reddish fall color. Near the boardwalk in the Mixed Border. New foliage emerges gold before darkening to chartreuse as the summer progresses. Pink to blue lacecap flowers appear in June. Fall color is often bright orange to burgundy. Behind the Wilder Visitor Center. A dwarf, early-flowering form that was wild collected by Ernest "Chinese" Wilson. Typically pink flowered, blue only with very low acidity and plenty of aluminum. A heavy flowering and reliable performer. Right of the McSwain Center doors. The JCRA was fortunate to have seven wonderful students join us for the 2008 summer internship program. These students engaged in a diversity of activities and responsibilities during their internship program that broadened their horticultural knowledge outside a classroom setting. We sincerely appreciate all they contributed to the programs and gardens of the JCRA during their time with us. Bradley Cole recently completed his degree at NC State University in agricultural extension education, with a concentration in horticultural science. Bradley interned with the Wake County Cooperative Extension Service in spring 2008, and has worked for Eastern Landscapes in Coats, North Carolina, from 2005-2007. He is an Eagle Scout, and is a Friend of the JCRA. Bradley is from Coats, North Carolina. David Hoffman is an intern "early bird" in that he is interning with the JCRA prior to beginning his studies in horticultural science at NC State this fall semester. David is active in the Scouts, and he has considerable horticultural experience working for his parents at Hoffman Nursery. I believe he was happy to work with something besides grasses at the JCRA this summer! David is from Rougemont, North Carolina. Jessica Kitzmiller is a senior at Catawba College in Salisbury, North Carolina, majoring in environmental science and minoring in biology. She will be graduating in December 2008. Jessica has experience at Noah's Ark Wildlife Center, a non-profit organization founded and run by her parents that has rehabilitated wildlife since 1997. Jessica has done some interesting work for her senior research project, testing mercury levels in bird feathers. She currently lives in Raleigh. Jeffrey Malcolm is a horticultural science major. He has returned to acquire his B.S. degree in horticulture after a break of nearly ten years in his studies. During that time, Jeff worked in a number of landscaping positions. He was senior groundskeeper at Davidson College for six years, groundskeeper at the Methodist Home for two years, and a landscape technician at Paramount Carowinds for a brief period. He worked as a groundskeeper at Meredith College in 2007, and interned in the Department of Horticultural Science's greenhouse conservatory this past semester. Jeff is currently living in Apex, North Carolina. Stephen Panasci is a sophomore majoring in horticultural science with an emphasis in landscape design at NC State, and minoring in Italian. He related that he developed his interest in plants and biology from his uncle, who is a biology teacher. Stephen worked as a counselor at a youth camp in summer 2007. Stephen has a wide variety of artistic skills and has expertise in computer design programs. He is from Maplewood, New Jersey. Russell Reagan is currently majoring in horticultural science at NC State, and will graduate this fall. He is minoring in biology. Russell has been employed at the Phytotron here at NC State this past year, and previously has worked as an irrigation installer with Atlantic Irrigation and Landscaping. Russell is captain of NC State's Men's Rugby Club. Russell is from Mooresville, North Carolina. Michelle Rose is currently enrolled in the horticultural science program, with an emphasis in landscape design. Michelle has prior degrees in business management (B.A. ) and psychology (B.A. ). Michelle has also taken course work at Central Carolina Community College in the sustainable agriculture program. She is a passionate gardener, and manages the educational garden at her church. She is a Friend of the JC Raulston Arboretum, and lives in Cary, North Carolina. Interested in sponsoring an intern during summer 2009? Please contact Denny Werner at (919) 513-7006 or dennis_werner@ncsu.edu or Anne Porter at (919) 513-3829 or anne_porter@ncsu.edu. The Scree Garden is one of the newer gardens at the JCRA, having been planted in September 2006. Before we take a look at the plants in the Scree Garden, we should answer the question I hear most often, "What is scree?" In case you've forgotten most of your geomorphology (the study of land forms; for example, hills, mesas, cuestas, tombolos, and other arcane terms), scree is rocky debris that collects at the base of a slope. Due to the action of freezing and thawing, rocks break into smaller pieces and eventually slide downhill to form areas of scree, sometimes also known as talus slopes. Scree particles generally range from fist-sized down to gravels. There is usually an absence of fine particles and organic matter in scree; therefore, drainage is very sharp. Scree is most conspicuous and common in arid areas where mechanical weathering from frost action is more common, as opposed to the chemical weathering of rock that occurs in humid climates. Still, scree is not totally absent from climates such as North Carolina's, where it is found in some areas of the mountains. The scree beds at the JCRA are a rough attempt at duplicating natural scree. The area immediately west of the Ruby C. McSwain Education Center was chosen since it receives sun most of the day, with the afternoon rays reflecting off the building's wall. This mimics the hot, sunny, and dry conditions that plants growing in natural scree would experience. To create the Scree Garden, the turf in this area was killed, and the clay soil was broken up to improve drainage. Then a special soil mix, three parts sandy loam and one part PermaTill, was built up in berms on top of this subsoil. The berms reach a maximum height of about 4' and a width up to about 12'. A mulch of one to two inches of PermaTill was applied before planting. 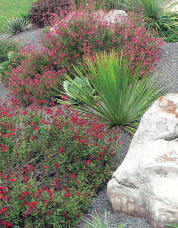 Plants in the Scree Garden come from a variety of areas where the climate is dry and/or drainage is exceptional. The agaves hail from the U.S. Southwest, Mexico, Central America, and the West Indies. There are 200–250 species of Agave; they are currently represented by about 20 taxa in the Scree Garden. The various species hybridize freely, and several exist in many varieties and forms, as well. Agaves are usually grown for their sculptural form and foliage color, rather than the flowers, since most species are monocarpic; that is, they flower once in their life, then die. They go out with a bang, however. In the larger species, a 15' stalk shoots up in less than two months and bears dozens if not hundreds of flowers. There are several plants related to the agaves in the Scree Garden. Yuccas (Yucca spp. ) are also in the Agavaceae family and are more widely known to most easterners, since a few species are native to this part of the country. The Nolinaceae family is represented by Nolina and Dasylirion species, both with elongate grass-like leaves, but with varying degrees of toothiness on the margins. The foliage of all of these plants flutters in a strong breeze, producing an almost hypnotic effect. But perhaps you aren't a big fan of the spiky nature of the Agavaceae and Nolinaceae. If you prefer something of a frillier texture, check out the ferns growing in the Scree Garden. Yes, there are ferns that like sun and dry conditions. Pellaea calomelanos sports blue-gray foliage that allows it to withstand intense sunlight; P. ovata has distinctive zigzag rachises and hails from Texas, Mexico, Hispaniola, and Central and South America. Not all these ferns have origins in dry climates, however. Cheilanthes lanosa, with the delightful common name of hairy lip fern, is indigenous to the Midwest and eastern United States. , including the North Carolina Piedmont and mountains. By growing on top of rock outcrops, it too lives in a xeric environment. But don't think the Scree Garden is only about the varying textures and foliage tones. There is also color—that is, other than green—to be found in the Scree Garden. Several cultivars of rain-lilies, Zephryanthes and Habranthus, put out their delicate pastel flowers after showers. And if you want shocking colors, you can't miss the many salvias (Salvia spp. ) in the Scree Garden. In fact, don't even try to miss the salvias! The various cultivars of Salvia greggii put out dark red, hot pink, magenta, or pink-and-white flowers, from spring to fall, with a short break in mid-summer. Salvia chamaedryoides stands out from the crowd with its gray-green foliage and cobalt blue flowers. We would be remiss if we did not thank Tony Avent of Plant Delights Nursery for donating many of the plants and Carolina Stalite Co. for providing their expanded slate product, PermaTill. The Scree Garden provides year-round floral and textural interest. Creation of a scree garden is relatively simple and allows one to grow a unique palette of plants typically challenging to grow in our hot and humid climate. In the preceding article, Charlie Kidder explained to you what scree is, how our garden was constructed, and talked about just a few of the plants there. I am going to tell you a bit more about a small sampling of some of the other plants that you may encounter. Clematis is a genus best known for large flowering vines that want their roots in the cool moist shade and their heads in the sun. So you would not expect to find Clematis growing in the inhospitable heat and drought of the Scree Garden, but many of the smaller, non-climbing species can naturally be found in just these types of conditions. These species are not as showy as that of their larger cousins, but are interesting to plant in that dry, sunny spot where few other plants will prosper. Clematis ochroleuca is one of those clematises. A native of the sandy Coastal Plain from New York to Georgia, it is perfectly at home on the well-drained soils of the Scree Garden. The foliage is simple, undivided, elliptically shaped, and opposite along the wiry stems. Cream colored sepals surround the stamens and pistils of the campanulate 0.5"–1" flowers borne at the tips of the 8"–12" tall shoots in spring and early summer. Following the flowers, tufts of silvery seedheads top the stems. Clematis fremontii, a similar species from dry rocky soils in Nebraska, Kansas, and Missouri, as well as from disjunct populations found as recently as 2006 in Georgia and Tennessee, has sepals that range in color from purple to creamy white. The young leaves and stems, as well as the flowers, have a slight pubescence covering them. Of the two plants in the Scree Garden, one has flowered white; maybe the second will be another color when it flowers. A third clematis species in the Scree Garden, C. hirsutissima, is native to much of the western United States and southwestern Canada. It naturally grows on sagebrush plains and in open ponderosa pine forests. This species has a similar diminutive size as that of the two preceding species, but with very different foliage. Clematis hirsutissima has very thinly cut foliage topped in early spring by small, purple, campanulate flowers. The entire plant is covered in a haze of fine hairs. Ours has yet to flower, but I look forward to seeing it in future springs. Violets are often thought of as the scourge of many a garden, popping up in the lawn and beds. When pulled, the plant returns from either the rhizomes or unseen hundreds of seeds that hide in the soil. One species, though, was welcomed into the Scree Garden. Viola pedata, the bird's foot violet, is not the thug that many of its relatives are. This small clumping species is a native to Wake County and can be found throughout much of the eastern half of North America. Where it gets its common name is obvious when one sees the deeply cut, three- to five-lobed, bird's foot-like leaves. In the wild, they are commonly found growing in dry, rocky, upland settings. There are two in the Scree Garden. Half- to one-inch flowers are perched over the 2"–4" tall foliage from April to June, with sporadic flowering in the fall. The first is the more common, pale lavender-blue flowered form, and the second is a cultivar called V. pedata 'Eco Artist Palette', which has smaller flowers, with the three lower petals being pale lavender blue and the two upper petals a deep royal purple. Blazing hot dry conditions are a great place to find ferns, right? Of course! These primitive plants have had plenty of time to fit into every niche in the world, including the xeric conditions of rock outcroppings, screes, and deserts, as well as the moist, shady soils we are so accustomed to. There are several in the Scree Garden that have been right at home for the last few years now. A favorite of mine is Pellaea wrightiana. The unreal powder-blue fronds appear and feel more like that of the cheap plastic foliage plants at your favorite fast food restaurant than that of a living fern. This semi-evergreen fern is largely native to the southwestern United States and northern Mexico, but there are a few disjunct populations in western North Carolina and South Carolina. This little fern grows to about 6"–8" and is right at home in tight crevices or well-drained soil in full sun. A plant that almost everyone has grown or is growing in their garden is phlox, so it is not surprising to find some species are even present in the Scree Garden. The genus Phlox is almost entirely from North America, aside from a few species that wandered over the Bering Land Bridge into northeastern Asia. Species growing in the Scree Garden are not the common tall garden phlox, so prone to mildew in the heat of summer, but are the smaller spring-flowering species. Phlox nivalis 'Camla' is the first of these phlox to flower. P. nivalis is a native of the Southeast with disjunct populations in Texas, Utah, and Michigan. At first glance, it looks much like that of P. subulata, but is differentiated by having woody stems and subtle differences in the shape of the flowers. It is found growing in sandhills and dry pinelands. P. nivalis 'Camla' covers itself in pale lavender flowers beginning as early as late December and January, but is typically at its peak in March and early April. A second species is Phlox bifida 'Betty Blake', a Midwesterner found growing in dry sandy soils of both open forest and plains. 'Betty Blake' forms a tight, non-spreading dome of slightly ridged foliage that looks like a foot-wide green hedgehog when not in flower. But in April, the dome is covered in lavender blue flowers that have petals so deeply cleft that they appear to have ten petals instead of five. The preceding plants have all had close association with the eastern United States, but there are many more plants in the scree from more distant places. One such genus, Sinningia, is a close relative of Saintpaulia—better known as the African violet. Sinningia, a Central American and South American genus, includes the florist gloxinia, Sinningia speciosa hybrids. There are two of note we have been growing in the Scree Garden for a few years now; S. sellovii and S. 'Butter and Cream'. Both of these are perfectly adapted to the well-drained, hot conditions of the Scree Garden. Hairs covering their succulent leaves, stems, and flowers help prevent evaporation and large tubers up to 6"–8" across store water and nutrients below ground. Sinningia sellovii, a species from southern Brazil and Argentina, has 0.75" long by 0.25" wide tubular flowers of deep salmon dangling from arching inflorescence up to 18" long on plants that measure up to 3' tall. Sinningia 'Butter and Cream', a hybrid of S. aggregata and S. tubiflora, has creamy white, 1.5" long by 0.5" wide flowers hanging from upright stalks 18" tall, and has light fragrance. A very different genus, Pulsatilla, has species throughout much of the temperate northern hemisphere. Pulsatilla, a member of the Ranuculaceae, is sometimes lumped into the genus Anemone. The similarities to Anemone are seen in the spring flowers, but the long, fuzzy, Dr. Suess-like seed heads distinguish them. Pulsatilla halleri, a sub-alpine species from populations scattered across Europe, has finely pinnate cut leaves. Up-turned flowers surrounded by sepals that range from pale purple to dark purple are 1.5"–2" across. All parts of the plant are covered in fine hairs, making them touchably soft and silky in appearance. The second species, P. cernua, is found in temperate east Asia, including parts of Russia, China, Korea, Mongolia, and Japan. Nodding flowers enclosed in fuzzy purple-red sepals are held just above the coarse pinnate leaves. Both species appreciate the heat and gritty soils of the Scree Garden. South Africa is noted for having one of the most diverse flora of any area in the world, so it is not surprising that we grow many plants in the Scree Garden from there. Included in the plants from South Africa is Aloe cooperi. This is unlike the aloe that sat on your grandmother's kitchen window, ready at a moment's notice to treat that burn from grabbing the hot handle of a pan. Aloe cooperi grows as an upright clump of grassy, slightly succulent foliage to 18" tall, much like that of Kniphofia, another South African. During the summer months, 24" tall stalks topped in orange flowers tipped in green are held like a torch above the foliage. In the winter, it dies back only to resprout in the spring. Wild A. cooperi can be found growing in both moist grasslands as well as dry rocky areas, making it a perfect choice for the Scree Garden. Much more can be found throughout the year in the Scree Garden from the winter-flowering bulbs to the salvias of summer. Find the plants of both North Carolina and distant regions of the globe all at home in the Scree Garden. Take time to stop and smell the Berlandiera the next time you come to the garden. Variation in height between plants within the same species is commonly observed. Have you ever pondered the basis for this observed variation? Variation in plant height is controlled by both genetic and environmental factors. These factors can limit plant growth either independently or in combination by affecting important physiological processes in the plant. For example, temperature is an environmental factor that can directly affect photosynthesis, respiration, and transpiration, thereby influencing overall plant growth. Other environmental factors that can limit plant height include moisture, light, and nutrition, among other things. Genetically, plant height can be described as a quantitative trait controlled by a number of genes. These genes are often located on different chromosomes and can affect different physiological processes that interact to influence plant height. Plant hormones play a major role in plant growth and development. Dwarfism can result from disrupted function of these essential plant hormones. The two major hormones that control dwarfism in plants are 1) Brassinosteroids (BRs) and 2) Gibberellins (GAs). In this article, I will focus on the role of these two plant hormones on dwarfism. Brassinosteroids (BRs) are essential steroid plant hormones. BRs are ubiquitously present in the plant kingdom where they control a wide range of physiological processes, including promotion of cell expansion, cell division, and organ elongation in young monocot and dicot plant tissues. The first study on BRs was reported by John Mitchell and his USDA coworkers in 1973, where they reported that organic extracts of Brassica napus (rapeseed) pollen (subsequently shown to be a rich source of BRs) promoted stem elongation in plants. After this discovery, significant research was initiated to understand the chemistry and physiology of these plant hormones. Michael Grove, PhD. , and others (1979) purified 4 mg of brassinolide (BL), the most bioactive form of BRs, from 40 kg of Brassica napus pollen to verify its structure. They determined that the structure of BL was analogous to steroid hormones in mammals and insects. Recently, the focus of BR research has been to understand BR biosynthesis and signal transduction pathways in plants using molecular genetic tools. Signal transduction is the process by which plant cells perceive and respond to a signal. The signal, such as a plant hormone, initiates biochemical events, which lead to functional changes within the cell. The stimuli that transmit the information to plants are both external and internal, such as light, mineral nutrients, gravity, water status, soil quality, mechanical tensions, temperature, growth regulators, and pathogens. Analysis of BR mutants in plants clarified the role of these hormones in various physiological processes. Brassinosteroid mutants have been identified in different plants including Arabidopsis, tomato, pea, barley, and rice. These BR mutants show severe dwarfism, demonstrating the indispensable role of BRs in stem elongation and leaf expansion. The BR mutants are of two types: 1) BR-deficient and 2) BR-insensitive. The BR-deficient mutants contain lesions in genes involved in the BR biosynthetic pathway whereas BR-insensitive mutants have aberrations in genes involved in BR signal transduction. BR-deficient mutants can be rescued to wild type (normal growth expression) by exogenously supplying the biologically active BRs such as brassinolide (BL); however, the BR-insensitive mutants cannot be rescued by the exogenous application of synthetic BRs. BR-insensitive mutants fail to perceive the hormone and, therefore, fail to relay the signal to downstream components of the signal transduction pathway. The identification of BR-deficient mutants played a major role in understanding the BR biosynthetic pathway, whereas the identification of BR-insensitive mutants helped researchers in understanding the BR signal transduction pathway. In recent years, a number of genes involved in BR-biosynthesis and signaling have been identified and cloned. During BR signal transduction, BR binds to a cell-membrane bound receptor known as BRASSINOSTEROID INSENSITIVE 1 (BRI1). The binding of BL to BRI1 activates BRI1 and the signal is passed to other components that occur downstream from BRI1 in the pathway. The downstream components include the transcription factors BES1 and BRZ1. These transcription factors control BR-responsive gene expression by binding to a regulatory region of the BR-responsive genes. BR-responsive genes include cell wall and growth-related genes, suggesting that BRs promote elongation of cells by modifying cell wall properties. Research on BRs is relatively recent, having started only in last quarter of the twentieth century. Considerable research remains to be done in this area to fully understand how these hormones control dwarfism by regulating genes involved in various important physiological processes. It is important to understand the interplay of BRs with other plant hormones such as GAs, which affect plant growth and development and therefore dwarfism in plants. The other important hormone group that controls dwarfism in plants is Gibberellins. GAs are a large family of plant hormones that affect a broad range of plant growth and developmental activities, including stem elongation, leaf expansion, seed germination, and flowering. Similar to BRs, GA-deficient and GA-insensitive mutants show severe dwarfism. The physical characteristics of these mutants helped in understanding the physiological role of GAs in growth and development. The biosynthesis of GA has been very well characterized. The GA-deficient mutants played a major role in understanding the GA biosynthetic pathway, whereas GA-insensitive mutants helped researchers in understanding the GA signal transduction pathway. The GA signal transduction pathway leads to the expression of GA responsive genes. Similar to BRs, GAs alter the bio-physical properties of cell walls by increasing the level of cell wall modifying enzymes. The green revolution in the 1960s and 1970s greatly increased the yields of wheat and rice. This increase in yield was mainly due to creation of new varieties by plant breeders, and the subsequent adoption by farmers of these varieties. These new, high-yielding varieties were shorter, gave more grain yield at the expense of straw biomass, and were more resistant to damage by wind and rain. Subsequent research has demonstrated that these new varieties were shorter because of their abnormal response to GAs, hence they represent GA mutants. These varieties contain lesions in genes involved in the GA signal transduction pathway (i.e. , perception and response to GA). Recently, it has been shown that new genetic variants of rice, which have very erect leaves due to defective BR biosynthetic genes, can capture more light for photosynthesis and can store more nitrogen for grain filling, thereby increasing grain yields. Commercial plant growth regulators (PGRs) that are used in commercial horticulture to control height, such as Topflor, contain active ingredients which effectively reduce internode elongation through the inhibition of GA activity. Topflor can be used as a growth retardant on a number of ornamental plants such as chrysanthamums, impatiens, dahlias, Easter lilies, pansies, geraniums, poinsettias, and sunflowers. A related PGR, Cutless, is also used on turf grass as a growth retardant. The understanding of underlying molecular mechanisms involved in the signal transduction and biosynthesis of BRs and GAs can have great practical applications in the future. The alteration of genes involved in the signaling and biosynthesis of these hormones can help in generating plants with controlled growth properties which may be directly applicable in field crops, horticultural commodities, and ornamental and nursery plants. Indeed, it may turn out upon further investigation that many of the dwarf ornamental varieties currently planted in gardens throughout the world may, in fact, be mutants in the GA or BR pathways. The JCRA has recently introduced a number of exciting new cultivars from its breeding program. Below is a brief description and information on availability. This brand new butterfly-bush is a selection derived from a cross of 'Lochinch' × 'Dartmoor'. It combines the silver-gray foliage and medium purple flower color of 'Lochinch' with the attractive, branched panicle architecture of 'Dartmoor'. The panicles arch slightly. As an added bonus, the flower buds themselves are lovely when they just begin to show color, and, of course, full bloom is quite beautiful. The plant is vigorous, growing 5' to 6' tall, but denser and more highly branched than most butterfly-bush cultivars. This cultivar was just recently distributed to North Carolina nurserymen for trial at the recent summer trade show, and is not yet available in retail channels. It is not patented. This new Lantana originated as an F2 selection derived from a cross of Lantana 'Miss Huff' 'Confetti'. The cross was made by undergraduate student Vance Whitaker in 2002 under the direction of Denny Werner, Ph.D. F2 seed were derived from open pollination of the F1 family, and F2 progeny were grown at the Sandhills Research Station in 2004. One selection demonstrated moderate vigor (less than 'Miss Huff') and flower color similar to the male parent 'Confetti'. 'Sunset Beach' has proven cold hardy and in Zone 8, but has not been trialed in Zone 7. However, based on the 'Miss Huff' parentage, it is likely to perform well in Zone 7. 'Sunset Beach' was recently distributed to North Carolina nurserymen for trial at the recent summer trade show, and is not yet available in retail channels. It is not patented. This new butterfly-bush was released this year, and is currently available at a limited number of garden centers. It should be widely available in spring 2009. 'Blue Chip' has a unique compact, spreading growth habit. Its growth rate is considerably less than that of other butterfly-bush cultivars, and it is easily maintained at a height of 2'–3'. The inflorescences are very dense and shortened as compared to the typical elongated inflorescence of Buddleja. Flowers of 'Blue Chip' are very fragrant, and foliage is semi-evergreen, showing retention into winter similar to its Buddleia lindleyana parent. The compact growth habit and dense foliage of 'Blue Chip' will allow it to be used in a wide range of landscape situations. 'Blue Chip' produces small, distorted anthers, and shows no evidence of pollen production. 'Blue Chip' shows evidence of seed production in a field setting, but considerably less than that of other Buddleja cultivars. A plant patent for 'Blue Chip' has been applied for. 'Miss Ruby' was selected for its semi-compact growth habit, silver-grey foliage, and unique flower color. The flower color of 'Miss Ruby' is a true pink with little to no purple contamination. The standard pink cultivar in the trade, 'Pink Delight', has distinct purple contamination in the flower. 'Miss Ruby' was named in honor of Ruby McSwain, for whom the Ruby C. McSwain Education Center is named. 'Miss Ruby' is currently included in the Royal Horticultural Society (RHS) Buddleja trials in Wisely, England, and I have heard it is being well received. 'Miss Ruby' was released in 2008, and will be available in garden centers in 2009. A plant patent for 'Miss Ruby' has been applied for. Yes, I'm back! Well, I never really left the Arboretum in my heart, and I have continued to enjoy wonderful relationships with the JCRA staff, donors, volunteers, and friends over the last two years. Yes, I'm back. . .and I could not be more pleased! It is such a joy to have this new opportunity to build on past friendships and to make many new friends. I am ready to "dig" in, and with your help and support, we will make this a great year for the JC Raulston Arboretum. Yes, I'm back. . .so please call on me if you have any questions, concerns, or if I can assist you in any way. My e-mail is anne_porter@ncsu.edu, and my phone numbers are (919) 513-3826 and (919) 513-3463. Thanks to the wonderful support of the Arboretum's sponsors, donors, volunteers, friends, and staff, the 2008 Gala in the Garden was the best Gala ever—raising more than $80,000 to benefit the JCRA. The weather could not have been more perfect, and everyone agreed that the new layout was a huge success. An enormous thanks to our 2008 Gala Committee, led by honorary co-chairs Laura and Larry Wooten and Mary and Claude Caldwell, and event chair Jill Adams; a sincere thank-you and hearty well done to Barbara Kennedy, JCRA volunteer coordinator. For more information and to view the 2008 Gala pictures, please visit our Web site at https://www.ncsu.edu/jcraulstonarboretum/. Gala sponsors and donors are listed on the facing page. The National Agricultural Alumni and Development Association's Volunteer Service Award was presented to Bobby Wilder at the 2008 NAADA Conference in Kailua-Kona, Hawaii, on June 17, 2008. Bobby Wilder graduated from NC State University in 1959 with a B.A. in science education. He was a good friend of the Arboretum's founder, J. C. Raulston, and has been actively involved in the JCRA for more than 30 years. As a supporter and volunteer, Bobby is truly one of the Arboretum's most treasured friends. Along with providing leadership and annual support for the Arboretum's student internship program, he has made a planned gift that will fund two endowments to support this program. For more than ten years, Bobby and his company, Century Framing, have been silver sponsors of Gala in the Garden, the Arboretum's main fund-raising event, plus he has sponsored various lectures and symposia throughout the years. Recently, Bobby set up another irrevocable charitable gift annuity that will generously support the JC Raulston Arboretum Endowment for Excellence and fund the new Bobby G. Wilder and Jack R. Lamm Horticultural Scholarship Endowment. Dean Johnny C. Wynne notes that "Bobby has given more than $50,000 in outright gifts, and he has committed more than half a million dollars in planned gifts to support the JC Raulston Arboretum and the College. " Throughout the years, Bobby has served in almost every volunteer capacity. He has logged more than 1,000 hours of volunteer service over the last 15 years and many more hours before official volunteer records were kept. These hours include recording plant records, mailing newsletters, being a host in the Visitor Center, and serving as an historian for the Arboretum. The quiet giving of his time, his energy, and his resources to better the Arboretum is second nature to Bobby. Bobby has served as an officer for the North American Rock Garden Society Triangle Chapter for more than 25 years, and has been recognized for his service at the local and national levels. Because of Bobby's many hours of dedicated service and his generous philanthropy to the Arboretum, our Visitor Center was named the Bobby G. Wilder Visitor Center this past May. He was recognized for this honor by Chancellor Jim Oblinger at the 2008 Gala in the Garden. Bobby's volunteerism, leadership, and support have inspired many others to follow his exemplary lead. The JC Raulston Arboretum is lucky to have such an enthusiastic advocate for its programs. Mary and William Joslin are longtime members and major donors of the JC Raulston Arboretum. Many people know Mary and Bill through their beautiful garden and their annual spring open garden days. The Joslins purchased this property in 1950 and began planting the garden before house plans were drawn. House and garden development spared native plants as much as possible so that original beeches, oaks, tulip poplars, and one persistent mountain laurel remain still. Over the years, the Joslins have accumulated an extensive collection of native and exotic plants. Some of the most treasured cultivated plants in the garden were gifts from J. C. Raulston, William Lanier Hunt, and Mary's mother, May Roper Coker. The Joslins have made their garden a generous gift to NC State University. The garden serves as an extension of the JC Raulston Arboretum and as an invaluable resource for University faculty, students, and the community. In addition, the property is protected by a perpetual conservation easement that is overseen by the Triangle Land Conservancy. Mary Coker Joslin grew up in Hartsville, South Carolina, in the Brown House, now known as the Administration Building of Coker College. The College was founded by her grandfather in 1908 and has been a primary influence in Mary's life. This new book of remembrances is her gift to Coker College in honor of its centennial celebration. This is Mary's fourth book, and everyone is sure to enjoy the pictures and stories in her charming new book! Congratulations, Mary—and keep up the great work! The roses will miss him—as will all of the friends who loved this gentle, kind, and giving man. Throughout Harvey Bumgardner's, Ph.D. , distinguished career as an NC State professor of poultry science, he made many contributions to the University and to the poultry industry. In addition to these achievements, Harvey gave freely of his talents to local theater and to the horticultural community. Renowned for his expertise as a rosarian, he was responsible for bringing roses to countless gardens in historic Oakwood and other areas of Raleigh. Harvey was the founding rosarian for the Finley-Nottingham Rose Garden, where he and Anne Clapp shared many fond hours as the volunteer leaders of this beautiful garden. Harvey gave countless volunteer hours of service to the Arboretum. To further demonstrate his commitment, in 1998, Harvey established an endowment to support the JC Raulston Arboretum. In 2003, Harvey then gave a significant gift of real estate as a charitable gift annuity with the balance going into his unrestricted endowment for the benefit of the JC Raulston Arboretum. This truly remarkable man gave of his time, his talents, and his monetary resources. He was an inspiration to us all, and he will be sorely missed! Gifts to the Harvey L. Bumgardner Endowment to benefit the JCRA may be mailed to: Anne Porter, JC Raulston Arboretum, NC State University, Box 7522, Raleigh, NC 27695-7522, or gifts may be made online at https://ceres.cals.ncsu.edu/advancement/gifts/ (search for the keyword "Bumgardner"). American horticulture lost a dear friend with the recent death of Dale Henderson of Virginia Beach. She was a mover and shaker in promoting horticulture and gardening excellence, known for her energetic work with the Garden Club of America, serving on various committees at the state and national level. At her Virginia Beach home, she was an avid gardener, attaining master gardener status, and was a longtime member of the Virginia Beach Garden Club. Regionally, Dale was probably best known for the founding twenty years ago of the Tidewater Garden Symposium, an annual spring gathering in Virginia Beach of nationally known speakers. Plant explorer Dan Hinkley frequently appeared in the symposium series and remembers a primrose she gave to him, as well as to other speakers. Dan recalls, "Dale kindly sent me a primula to grow from her garden years ago and indeed we did name it in her honor. I thought it was a sensational plant, as did our customers, as we always sold out. A very curious bricky red and long lived; I think it was based on Primula vulgaris and P. veris. I thought it perfect in the garden with Corydalis solida 'George Baker'." Dan sold the primrose through his former Heronswood Nursery under the name Primula 'Dale Henderson'. Garden writer Pamela Harper, of Seaford, Virginia, was a longtime friend of Dale and a frequent participant at Dale's symposia. Pamela remembers, "Dale was the heart and soul of the Tidewater Symposium. She was never other than cheerful and positive. Dale was generous with her time and with her plants. [Dale's primrose] flourishes in my garden, and I am sure in many others, as a reminder of a lady who will be very much missed." Plant Delights Nursery owner Tony Avent remembers Dale frequently calling him to ask for advice and recommendations for speakers for the Tidewater Symposium, often planning it two years in advance. In the 1980s, Dale and J. C. Raulston became friends and traded plants with each other; some plants had been earmarked for her, but undelivered, at the time of J. C. 's death in 1996. Dale became a member of the Friends of the Arboretum and, with friends from Virginia Beach area, attended Arboretum symposia. Her friendship with J. C. and her love of horticulture and teaching others led Dale to establish the Dale and Thom Henderson Internship of the JC Raulston Arboretum at North Carolina State University. The objective of this internship is to encourage a worthy student who has demonstrated an avid interest in understory trees and landscape plants to pursue a career in horticulture specializing in these areas. Donations to Dale's memory may be made to Dale and Thom Henderson Internship at JC Raulston Arboretum, care of Anne Porter, JC Raulston Arboretum, NC State University, Campus Box 7522, Raleigh, NC 27595-7522. Marcia Winslow was an Arboretum friend in both life and death. A woman of energy, strong opinions, and commitment, Marcia volunteered in the late 1990s as a tour guide, welcoming visitors and showing them around the Arboretum. When her health no longer permitted her to maintain all her activities, Marcia and her husband John moved into Springmoor, and Marcia continued her support for the Arboretum. In 2008, a decade after her time spent as a volunteer, Marcia died, leaving a bequest to the JC Raulston Arboretum in her will. This was a "quiet" gift, one she had established as a good surprise, without prior notification or recognition in her lifetime. When Anne Porter was notified by Marcia's executor of the generous and unexpected bequest, we all had to think back to remember Marcia, our unsung friend. This is a mark of true philanthropy. She loved the Arboretum and gave generously toward its support, quietly, in private, and without seeking attention for herself. Thank you, Marcia. I hope there are many more who, like you, will remember the Arboretum in your will, not for public recognition, but because it is, in your mind, the right thing to do good in private. Guest writers Bobby Ward and Vivian Finkelstein contributed Dale Henderson's and Marcia Winslow's remembrances, respectively. Vivian Finkelstein so beautifully wrote about the "quiet" gift of Marcia Winslow. This is a beautiful way to show how much you care about a loved one or a loved organization. However, it is so very important that the will bequest language is written correctly, or your gift may not reach its desired designate. The correct designation language is especially important for the JC Raulston Arboretum, as the JCRA and most of its endowments are under the auspices of the North Carolina Agricultural Foundation, Inc. , and must be specified as such. If you are one of those "quiet" donors with a will bequest to the JC Raulston Arboretum, we sincerely thank you. We also encourage you to check the "wording" of your bequest. In most cases, bequests should be made to the North Carolina Agricultural Foundation to be most effective. The North Carolina Agricultural Foundation was founded in 1944 to aid and promote, by financial assistance and otherwise, all types of education and research in agriculture at or through the North Carolina State University at Raleigh. The Agricultural Foundation's Federal ID number is: 56-6049304. If you have any questions regarding will bequests or any planned giving opportunities, please contact Sonia Murphy (the College's gift planning director) at sonia_murphy@ncsu.edu or (919) 513-0637. Alternatively, you may wish to visit the planned giving Web site at http://www.cals.ncsu.edu/advancement/ (click on CALS Office of Gift Planning on the left side). All inquiries are completely confidential. Timber Press is publishing two books by JCRA members. Congratulations, Pam and Roy. The spring 2009 Friends of the Arboretum Lecture schedule includes Pam and Roy. Please join us for these and all other FOA Lectures scheduled for 2008 and 2009. Bob Lyons, Ph.D. , was awarded the University of Minnesota's Outstanding Achievement Award on September 3, 2008. The award is the highest nondegree award conferred upon distinguished alumni by the University of Minnesota. It recognizes graduates or former students of the university who have attained unusual distinction in their chosen fields or professions, or in public service, and who have demonstrated outstanding achievement and leadership on a community, state, national, or international level. The JC Raulston Arboretum is pleased to present the 2007 Annual Report, recognizing our donors, supporters, and volunteers. We extend a sincere thank you to all the individuals and organizations that supported the JCRA in 2007. Your support makes possible the continued growth and development of our gardens and educational programs. Plants and gardening nurture the human spirit and enhance our quality of life. We are honored that you have chosen to support this special Arboretum as it continues to fulfill its mission of excellence in research, teaching, and outreach. It is difficult to imagine where the JC Raulston Arboretum would be without the support from our members, the Friends of the Arboretum. With the growth of our membership, we can continue to offer new educational programs, create and maintain our garden spaces, and inspire the community at large. Jack and Micki Cox, Jr.
George and Reba Worsley, Jr.
C. T. Wilson Construction Co.
John and Marilyn Ranson, Jr.
William and Elizabeth Barnett, Jr.
Arthur and Jean Chard, Jr.
Powell and Ann Fox, Jr.
Andrew and Sheree Goettman, Jr.
Dave and Lois Jones, Sr.
John and Jane Kanipe, Jr.
David and Lynn Matthews, Jr.
Thomas and Jane Norris, Jr.
Dale and Brenda Nutter, Jr.
Robert and Charlotte Oehman, Jr.
R. F. and Frances Paschal, Jr.
Charles and Patricia Poe, Jr.
William and Emily Powell, Jr.
Charles and Kathryn Robinson, Jr.
Marvin and Ann Thompson, Jr.
A heartfelt thanks to these donors who gave special gifts to the Arboretum over and above membership. Alfred and Blair Carlton, Jr.
James and Elsie Eads, Jr.
Edward and Carol Smithwick, Jr.
John and Bonnie Yelvington, Jr.
Corporate matching gift programs are a great way to optimize individual gifts to the JCRA. We sincerely appreciate the generosity of the corporations that participate in this program and the donors who make the initial gift to benefit the Arboretum. Support through in-kind gifts are vital to the success of our events, especially the Gala in the Garden. They also provide services and plant materials that keep the Arboretum beautiful for everyone. All donations made to the JC Raulston Arboretum are tax deductible. North Carolina Division, Greenleaf Nursery Co. The Gala in the Garden is the Arboretum's signature fund-raising event held each year on the first Sunday in May. In 2007, our sponsors contributed over $60,000. Thank you 2007 Gala in the Garden sponsors for making this event a huge success. An endowment is a lasting legacy. A special thanks to these donors for their foresight and generosity. Contributing to an endowment is a long-term investment that provides financial stability for the Arboretum year after year. For more information on how you can create an endowment to benefit the JC Raulston Arboretum, please contact Anne Porter at (919) 513-3826. The gift of service is invaluable to the Arboretum, and we are very appreciative of the many hours our volunteers devote to the Arboretum. Our volunteers share their many talents and their time to make the Arboretum a wonderful place for all to enjoy. We couldn't do it without them. Thanks to all of you. The JC Raulston Arboretum's volunteers handle many tasks at different times, but we were able to gather some for this group photograph, along with a few staff. Our volunteers are a great group, and we depend on them every day. Our volunteers gave over 8,000 hours of their time in 2007. Their efforts have made the Arboretum a showpiece in the community. After a very busy spring, it is nice to take a breather and enjoy the gardens. The weather has been kinder to us this year and a few good rains have done wonders. Activities subsided somewhat over the summer, but picked up again in the fall. We have a number of new volunteers on board and we are glad to have them. A Walk in the Winter Garden is an annual event that brings a lot of visitors. Tim Hinton, volunteer tour guide, leads a group through the garden. Many visitors want to see plants that look good during the winter. Tim has lots to show them. The 2008 Gala in the Garden was a big success, but it takes many hours of preparation to make any major event successful. Volunteers Jennette King, Verna Medeiros, and Sandy Reid set up one of the auction tents. Do you ever wonder how all those plant labels and name badges get made? We have three dedicated volunteers who are experts at operating our label machine. Cindy Heinlein and Sherman Criner are shown here during their day at work. Rikke Machilek, not shown, is our third engraving volunteer. Mary and Claude Caldwell were honorary chairs at this year's Gala. They are pictured with Bryce Lane. Mary and Claude are longtime volunteers who have helped out in many different ways. Three volunteers on the Master Plan team, Beth Jimenez, Jeff Evans, and Harriet Bellerjeau have some fun while working on some of the many details for this project. Thanks for the great work so far. Many of our benches were in dire need of repair. Fortunately, we have some real craftsmen in our midst. Frank Moore, Wayne Friedrich, and Jim Schlitt stepped up and worked on getting the benches in like-new shape. Great job, guys!